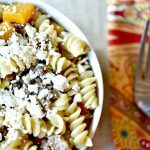 This easy fall pasta recipe with butternut squash, sausage, feta cheese, yellow onion, rotini, and sage is a sponsored conversation written by me on behalf of Barilla® and Johnsonville®. The opinions and texts are my own. Five weeks ago, my husband and I started working our way through Financial Peace University. We’ve always been a fan of the financial guru behind it but only loosely followed the principles…er, baby steps. We knew we struggled staying on budget in our eating out category, but we didn’t realize quite how bad we had let things become. With the chaos of summer ending and school starting back, we had gotten pretty free with our budget. Our eating budget wasn’t even really a budget category anymore, it was just a number we would have liked to spend. But a week in with that money gone, we just kept going. To accomplish our financial goals and keep up without totally killing our social life, we’ve increased our grocery budget a little and are making a more concentrated effort to make a meal plan. And actually stick to it. This allows us some flexibility to make our favorite meals while flirting with flavorful, quality ingredients for new recipes that can make a meal for the four of us or entertain others. 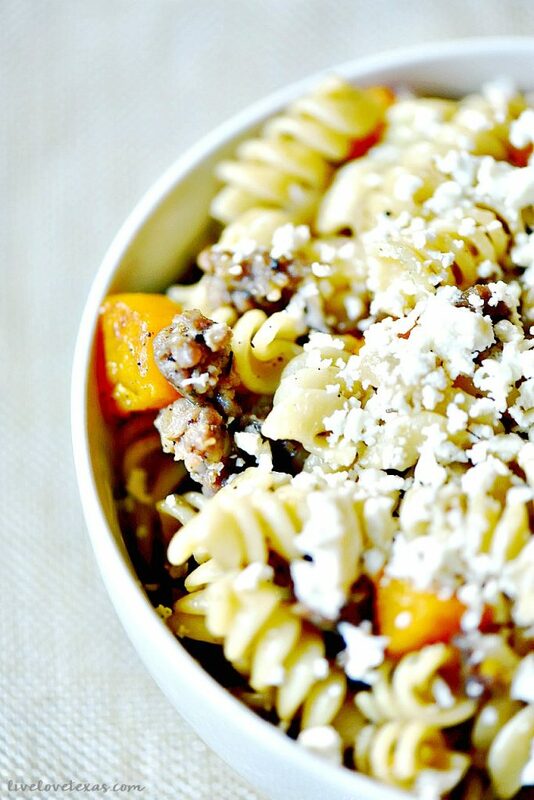 It’s no secret that pasta makes a hearty base and a blank canvas for creating a delicious meal. While spaghetti is always a crowd pleaser, I like to venture out and experiment beyond a simple sauce. 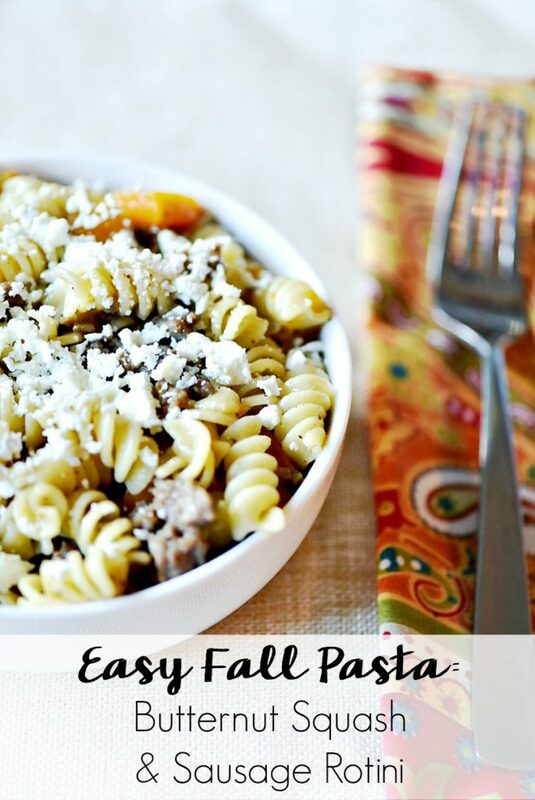 Last week’s pasta recipe was inspired by the rich, earthy flavors of fall but cost less than $10 for all the ingredients. To keep my work to a minimum and avoid any rude slurping at the table, I usually make rotini or farfalle so the pieces are bite sized for little mouths. 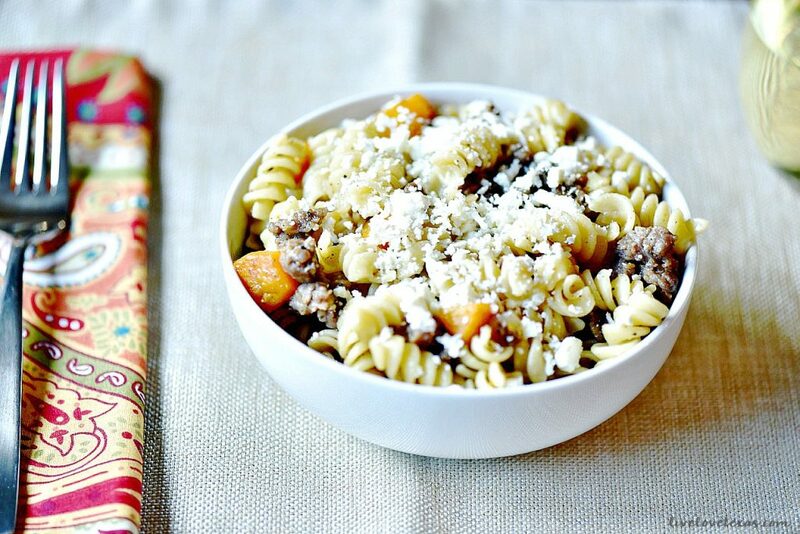 Knowing I wanted an easy fall dish, I chose to create a fresh Butternut Squash and Sausage pasta recipe. I combined Barilla Rotini which is quick, easy, and a versatile pasta that everyone loves along with Johnsonville Mild Italian Sausage (Kroger was out of ground, so I went with links and just removed the casings). 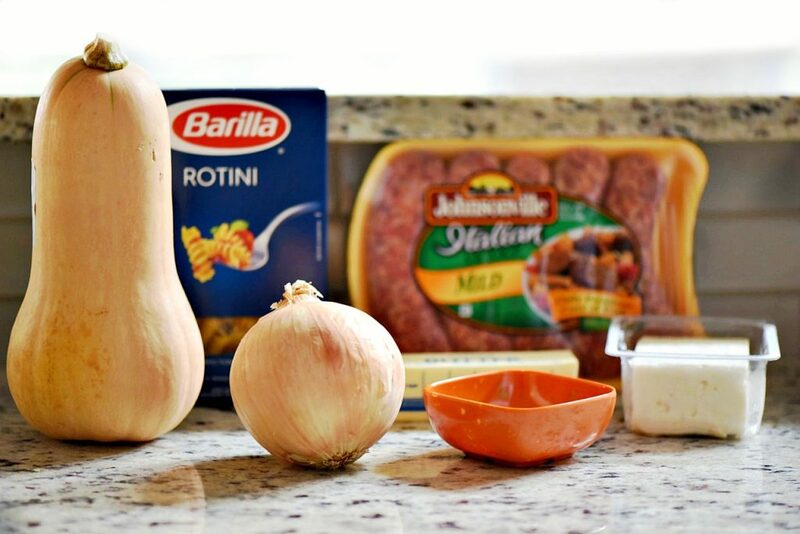 Our family loves Johnsonville because it’s so convenient and flavorful when creating pasta recipes. Boil Barilla rotini according to package. Meanwhile, melt butter over medium-high heat and saute butternut squash until tender but firm. Add onion and continue cooking until onion is browned. In the same skillet, brown sausage and sprinkle with salt pepper. Then combine all ingredients in skillet and serve!